Santa Maria Golf and Country Club lies just outside Marbella on the Costa del Sol and it offers its members a number of sporting pursuits from bowls and tennis to golf. The course here started out as a 9-hole layout in 1991, extended five years later to a full 18 holes – in fact, to play holes 7 to 13, golfers have to use a tunnel to cross to the new fairways on the other side of the Malaga-Cadiz motorway! The architect Dave Thomas is said to be involved in the construction of an additional 18-hole course which would really take the club to the next golfing level amongst the big boys on the Costa. 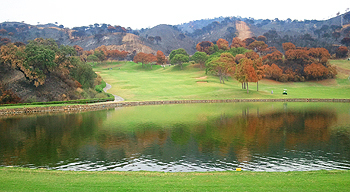 Set in a hilly location, Santa Maria is a parkland track routed in an out-and-back formation, extending to a length of 6,144 yards (par 70) with water in play at many of the holes. The five par threes are the best holes at Santa Maria and because there are four of these short holes on the back nine, the yardage on the inward half is some 500 yards shorter than the front nine. This is a pretty course but it just escaped the ravages of the Marbella fires in August 2012, all around the periphery the blackened country side shows testament to that. Nevertheless the course has escaped any damage. It is short (5 par 3's of which 4 are on the back 9), and if you get a drive of 180-200 yards away then a par is possible on pretty much all of the par 4's without much trouble. The greens look slowish but they aren't, the bunker sand is lovely and its not over bunkered. Only really a couple of show-piece holes on the course. Suits the shorter hitters - but I would advise a buggy as there are some long hilly walks between tees. Santa Maria Golf Club is a really nice setting to play golf. Set in the Elvira hills it provides a good test for all golfers. It’s not the longest course but it’s pretty tight and if you can keep the ball in play you can enjoy some good scoring round there. I play it every time I’m in Spain.The only negative is the cost, like most good courses in and around Marbella province it is pretty expensive.